While not "strictly" better, Lili's Triumph is the first clear power creep over Diabolic Edict. The fact that it is also a beast in EDH is just icing. Ah. But can you use the plus one without another creature as it's "up to" so it could just be zero? counter target non creature spell. Would you play Negate in Legacy if it couldn't be countered? If enchanted thing would die or be exiled, return it to the battlefield. For one mana, that's really good. Say you want to use a 'walker ability but it'll kill your walker. Cast this, then use the ability, then the walker comes back and you can use it again. Good card is good, but niche. 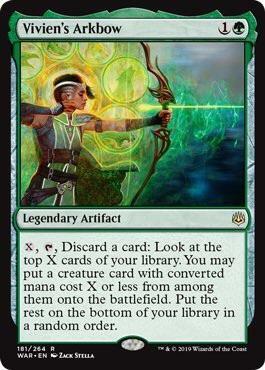 Oh my God that's going in Stax. Wow. May my Tangle Wire never die. For the cost of effectively one extra mana, it can also pump all your Ballistas (and whatever also has counters on it, like Arcbound Ravager, Hangarback or Steel Overseer). This is pretty damn good. This one can prevent damage from stuff like Ancient Tomb. Is there a way to abuse this where you can negate repeated self-damage? You have to get around the 2-for-1 problem of auras, in this case only when casting (or tucked), but still. Artifact abilities of artifacts your opponents control can't be activated. This seems like a good one card lock . . . You can cast this - use the first ability if you want, then the turn after use its second search up a Mycosynth Lattice in your SB, cast it, and opponent now can't use lands . . . turn after just keep turning the lattice into beats. So with a deck with Sol lands, you can probably cast this turn 2/3 and get the lock turn 4 ish? Should be even better in Vintage where you can use Workshops to cast Lattice faster. For the investment of one SB slot, this is a steal. The man that proliferates I feel like can have some potential. Someone said Ballista plus pentad prism. Also can be nasty with storage lands. Everflowing Chalice is nice with it as well as tangle wire in some sort of tezzeret deck maybe. Maybe its more modern possible than legacy. I got a kitchen table Thrummingbird, Paralax Tide/Nexus, Tangle Wire deck he will slot nicely into. That seems borderline playable for Grixis. Extremely surprised that this can be activated at instant speed. Between Sylvan Library and Mirri's Guile, this might get there. 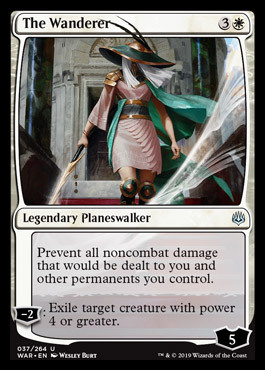 I think Vintage would love it just for the onesided Null Rod, but it's just really interesting for legacy as it can shut down the game relatively early all by itself. Lion's eye diamonds also help a lot. For example Karn + Sol Land + Land + Lion's Eye Diamond + Land = Turn 4 lock and that looks like minamal effor and doesn't stirke me as a god hand. Really just a "2 card Combo" in that form. Plus other accel and a Chalice Shell, it seems pretty scary already. Karn is just the single most busted 'walker I've ever seen (in Vintage). He's a win condition, a lock piece, AND a repeatable source of CA, all in one card. It's crazy. T1, you drop Karn, your opponent is on storm, you search for 3 sphere or Sphere of Resistance or something. Now they have to respond with no artifact mana available. Vs. Dredge? You grab some GY hate like Relic or Crypt or whatever, maybe Cage? Or needle or Spyglass or Tsabo's Web to shut down Bazaar. Vs. Shops? Damphing Sphere or something. Like, he's just cray cray in that format. In Legacy he's very good in a specific shell, and in Modern he's sort of ok? In standard, probably not that great. But in Vintage? Man, that's like T1 3sphere level beatings. It's a Sorcery, the card is in Portuguese. Still somewhat playable though.